218 Lake Road, Northcote, Auckland, New Zealand. 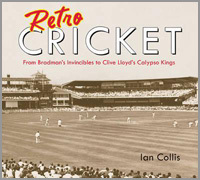 For those of us who love cricket played in whites, this superb photographic tome by Ian Collis will bring back many happy memories for those old enough to remember. Starting in the 1940s and continuing until the tail-end of the 1970s, this book uses many rare photographs and portrays the game as the game was played. Some photos will be familiar but many will not and this 400-page book must surely have been a labour of love for the author who gave up a successful accounting career to pursue his main love of sports statistics. Cleverly, one of the book’s first photographs shows a wartime shot of cricketers lying prostrate at Lord’s after a bomb had exploded nearby. Naturally, the book goes on to happier moments after almost six years with hardly any cricket and great loss of life during this period. Each decade is taken chapter by chapter and one of the aspects which struck me was how the level and degree of enthusiasm at the falling of a wicket becomes more apparent as the years went by through this collection. Fashions have changed through the years. Look at the photo of Sonny Ramadhin bowling in cap on page 182 and see how appearances had changed in the 1970s, one of cricket’s most defining decades. How many people remember being allowed on to the field after a Test? If not, take a look at the vast crowd at the end of the 1953 Oval Test after England had won the Ashes. This book captures many of cricket’s magical moments: stumps cartwheeling, wonderful catches and – whoops – the odd dropped one, fine shots and even cricketers celebrating with a cup of tea. Many of the legendary cricketers including Bradman, Miller, Sobers, Graeme Pollock, Lillee, Barry and Viv Richards all feature prominently and, within this superlative book, many of the world’s greatest cricketers can be viewed again. Granted, all these fine cricketers can be seen in many other books but there are far fewer photographic books and Ian Collis is to be congratulated upon his venture. As mentioned earlier, some of the photos will be recognised. There is a very famous photograph at the very end of the first Tied Test between Australia and West Indies in 1961 and, in Retro Cricket, there is one taken very slightly later which nonetheless still evokes the thrill of the moment. As we know, cricket is rich in history and in its literature and Retro Cricket is a must for a bygone era to bring memories flooding back.